Anyone get their hands on one of these rods? Thanks. I read that earlier but was hoping someone got a feel in his/her hand. No info on ECHO’s site yet. I’m interested. Never had an Echo before but after that BAG purchase, I wanna see what’s going on with a possible 5 weight - if it’s not terribly priced. I mean, if it’s got good reviews, maybe $250 is justified. While I can't speak to these new glass rods, I have been pleased with every Echo product I've bought so far and the service has been great. I snapped a graphite 10wt in half on a saltwater trip last year and they air shipped me a new section so I wouldn't be without that rod for the rest of the trip. For free. Can't argue with that. My only real issue with the ECHO BAG is the low grade cork packed with lots of filler. For $279, one would expect more quality. I was a nit picking when I did a review of the BAG but it is a great rod. Interesting link, thanks. It says that the River Glass series replaces the Echo Glass series. Looks like different reel seats, which might be a good thing if Newfydog's experience was widespread. I like my 8'6" 5wt so far (which I think is part of the series being replaced). Funny, someone commented last year as I was hiking into a wilderness area that I was carrying a "bamboo rod" (I guess the color looks similar). Probably no chance of that for the new series, if the pictures are any indication. Damn, that warranty service is on point. I snapped the tip of my F2 a couple weeks ago (being stupid) and Scott has made it pretty clear to me that I won't have it back until the end of Summer. Not my first rodeo breaking a Scott rod. Definitely the longest repair service Ive witnessed. Also.... I wasnt the og owner, and I know that I shouldn't feel entitled to have it repaired for the cost of (inflated) shipping, but Orvis and Sage has fixed rods/reels for me as a second owner for the cost of shipping no problem. Didn't even ask for special treatment, they just did it. I wonder if the tapers have changed or if its just the look of the blank and hardware? I have the 4 weight echo glass. Its an ok rod. I think there are better offerings out there for the same price or cheaper. Sometimes I like the way it feels, sometimes I don't really care for it. Mine developed cracks in the epoxy of all the guides. The shop I got it from wouldn't deal with the warranty because they said I didn't store it properly. Had to deal with the warranty myself which ended up costing almost the same amount as what I bought the rod for (after the international warranty fee and shipping both ways). Replacement rod started doing the same thing, not to mention that the guides weren't fully aligned straight. So now I am in the process of stripping and rebuilding it. Glad to hear other had better luck with Echo. I've never had good luck with factory made rods, which led me to building my own. Now I have no one to blame but myself! It also looks like the glass switch/spey line is gone. Surprised as those were very positively received. yep, my 7wt switch isn't going anywhere! 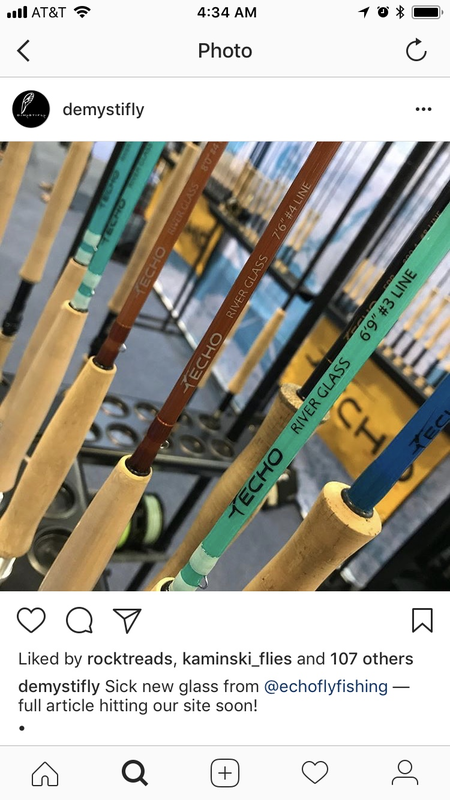 Did anybody have issues with rod finish on the original Echo Glass rods? A friend had a #3 on which the finish cracked and fell off, spent almost the value of a new rod to ship it to Echo and back, then the replacement proceeded to do the same. This seems like reason enough to change things! Based on rave reviews, I bought an Echo base #7 for heaving big bugs. I hate that club. Then I found an Echo Base #5 in a dumpster with a broken tip. I picked up a new tip from them for $17.50 and it is a really nice graphite 5 wt. I got a great deal from Cameron on a 9' 6wt big water glass which has become one of my favorite rods period. The reel seat fell apart but it was cheap and easy to replace. Seems to be hit and miss with Echo. I'm thinking about getting the BAG Quickshot 7 wt. Has anyone cast that specific rod? I see these are up on the Echo site now. The reel seats look like they are the same as the previous series. I still like my 8'6" big water glass rod. No issues with the reel seat so far. Has anyone cast the new river glass yet? Curious how it compares to the previous line up. I ordered a 4wt glass echo switch rod for 1/2 price a couple days ago. There are still a few in other weights on ebay new. $139 free shipping.